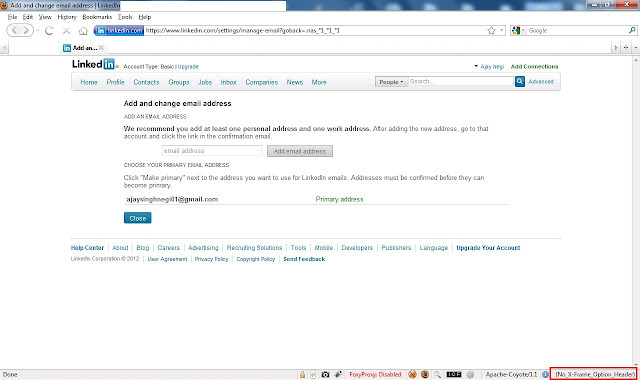 I have found Click Jacking & Open Url Redirection vulnerabilities on Linkedin Website on 6th and 7th August 2012. A Clickjacking vulnerability existed on Linkedin that allowed an attacker to add or delete a secondary email and can also make existing secondary email as primary email by redressing the manage email page. The redressed editor page with frame opacity set to 0 so it is invisible to the user. As the user drags the computer into the trash-bin and clicks the Go button, a new secondary email will be added into the Linkedin user's account. 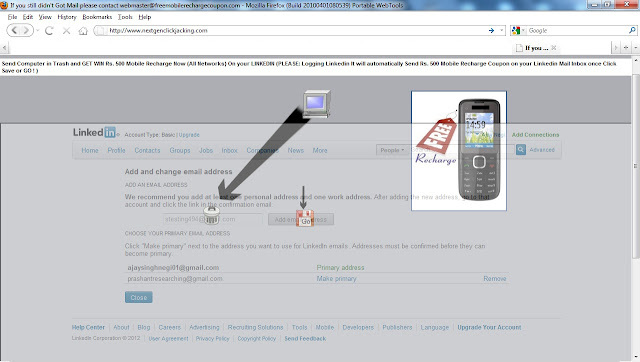 Secondary email added successfully into the Linkedin users account. No X-Frame-Options in servers response header. 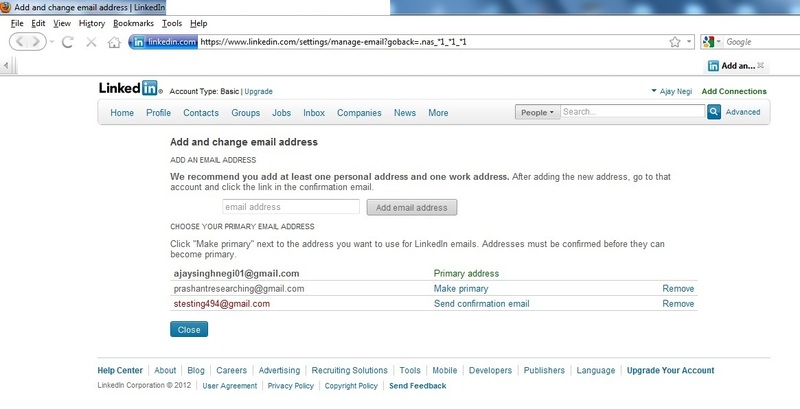 Linkedin addressed the vulnerability by adding X-FRAME-OPTIONS in header field which is set to SAMEORIGIN on this page. Open Url Redirection using which an attacker can redirect any Linkedin user to any malicious website. Below I have mentioned the vulnerable Url and also attached the Proof of concept video. While researching I have found that Stored XSS can be found Via Viewstate Parameter even when Viewstates Mac is Encrypted. The actual cause of this vulnerability existence is that the viewstate parameters value is not properly getting decoded on the server-side therefore any XSS payload in this paramter will get excuted and if there is any filter then it can be bypassed by converting the XSS payload in base 64 payload. 1. First input any random data in login page and submit it on any aspx application. 2. intercept the using burp proxy if there is any client side validation submitted request then modify the actual viewstate parameter as shown below. 5. using the web proxy burp we were able to inject the XSS payload and it also executed successfully after modifying and forwarding the intercept request but the interesting thing is that this payload was successfully executed using the vulnerable Viewstate parameter then this payload actually got stored in the server side and the XSS vulnerable page redirected to an error webpage with a different Url, then we copied and opened this Error page Url in another browser. 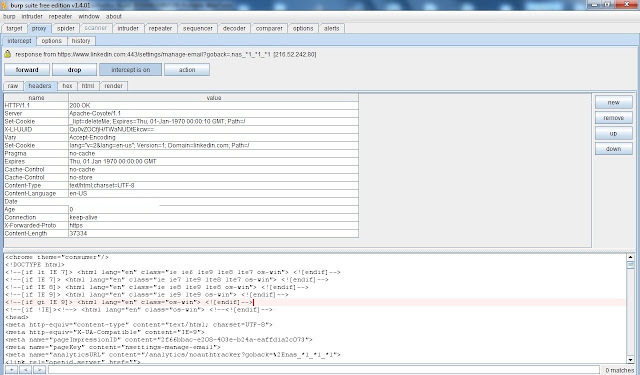 As the XSS payload is stored on the server side so this XSS payload got executed again and again. So, the same attack can now be done without any web proxy like burp as the malicious XSS payload is stored on the server side and that can be reused using the error page Url which was generated after the execution of malicious XSS payload using the web proxy burp. User inputs must be validated and filtered before being returned as part of the HTML code of a page. Don't rely on this security mechanism to protect against Cross-Site Scripting and SQL injection attacks. Make sure that proper input validation is built into web applications.